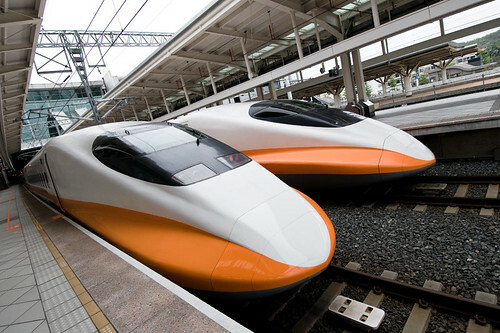 High-speed rail trains in Taiwan. They certainly look fast. Photo by loudtiger via Flickr. Streetsblog LA looks beyond all the local and national excitement for the “30 in 10” proposal and asks: if 30/10 funding is provided, can Metro be trusted to deliver? There’s some skepticism out there – from both advocates and officials – that things like procurement, construction management and operations could challenge Metro as it’s currently organized. There is confidence though as officials recognize that Metro is currently in a position it has never been before – a good position at that – with a new CEO and money from the first transit sales tax in 18 years. The Progressive Fix tells the fascinating – and rather sad – story of how America’s once state-of-the-art passenger rail system became the most antiquated of the developed world. Essentially, America’s passenger rail went from best to worst over a 60 year period. Progressive Fix blames misplaced government subsidies on highway and airport construction that essentially created unfair competition to the privately run (and taxed) passenger rail services. Another interesting revelation – the United States, as its passenger rail service floundered, actually gave Japan foreign aid money earmarked for the construction of modern rail infrastructure. The U.S. Health and Human Services Agency joins a number of other federal agencies in funding alternatives to car travel. You see, walking and bicycling is much healthier than letting a pollution spewing internal combustion engine move you around so the Health and Human Services Agency is helping fund a variety of projects that encourage walking, biking and more human oriented land use.